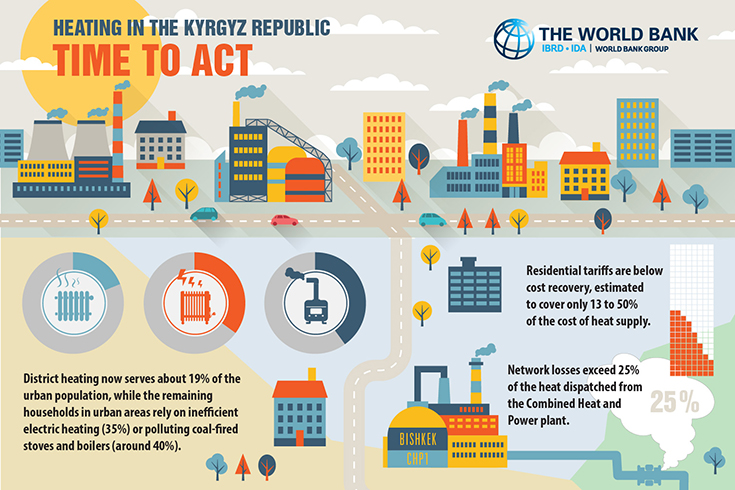 In a Wednesday report from the World Bank they highlighted weaknesses in the current heating infrastructure in the Kyrgyz Republic and suggested policy and investment measures to address this shortfall. They report that District Heating (DH) systems are only able to serve a fifth of the urban population due to lack of proper maintenance, funding and aging of the system. According to the report, these systems were implemented 20 to 50 years ago. Low electric tariffs have lead to an increase of electrical heaters. Those that do not use these methods make up 40 percent of the urban households that utilize coal-fired stoves and/or boilers. This has led to the citizens having a high number of diseases resulting from indoor pollutants. The bank recommends that an overhaul of heating infrastructure is necessary given the circumstances. Specific recommendations from the bank included rehabilitating DH systems, replacing inefficient heaters and implementing energy efficiency programs. The bank also suggested social assistance for citizens who would need it. The World Bank estimated that necessary infrastructure developments would cost approximately $515 million for Bishkek and Tokmok alone.